37519 at Booths During February and March 2008 C.F Booths took delivery of a number of class 37s. The company has always been very helpful to preservationists looking for vital spare parts, and to enthusiasts in general, allowing guided visits to their site on Saturday mornings. As class 50s share a number of components with Class 37s, e.g. 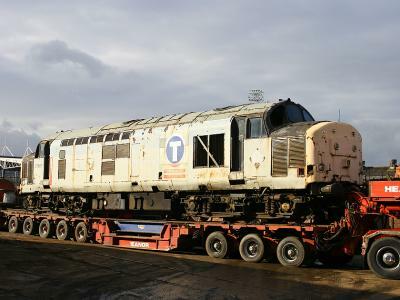 engine components, brake equipment, electrical switch gear and electrical machines, the opportunity was taken by RRRG to obtain a large number of components, which will be a significant help towards getting 50030 and 50029 operational again. 37519 is being cut on 1st March 2008. 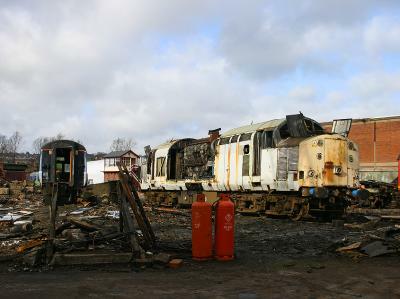 During February and March 2008 C.F Booths took delivery of a number of class 37s. The company has always been very helpful to preservationists looking for vital spare parts, and to enthusiasts in general, allowing guided visits to their site on Saturday mornings. As class 50s share a number of components with Class 37s, e.g. 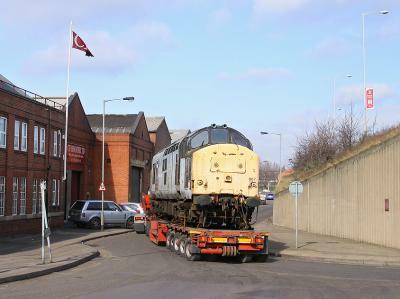 engine components, brake equipment, electrical switch gear and electrical machines, the opportunity was taken by RRRG to obtain a large number of components, which will be a significant help towards getting 50030 and 50029 operational again. 37519 is being cut on 1st March 2008. 37519 with bodysides cut away Another view of 37519 on the 1st March 2008 showing the bodysides cut away to provide easy access to the power unit. 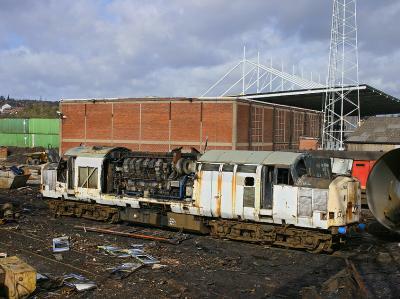 Another view of 37519 on the 1st March 2008 showing the bodysides cut away to provide easy access to the power unit. 37519 with a pile of ex-312 parts in the foreground 37519 at Booths on the 1st March with a skip full of ex-unit buffers in the foreground. 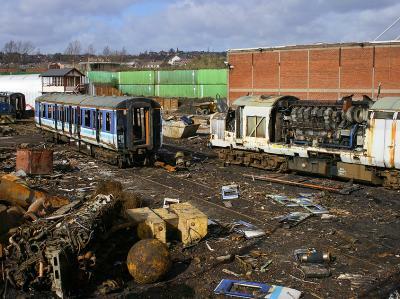 One of the class 312 units being demolished is seen to the left of 519. The class 312 units had been an unusual parts donor to Renown and Repulse, providing a source of multiple working sockets for the cab fronts, and some long terminal bars for the cubicle. 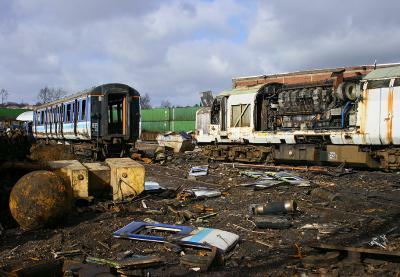 37519 at Booths on the 1st March with a skip full of ex-unit buffers in the foreground. 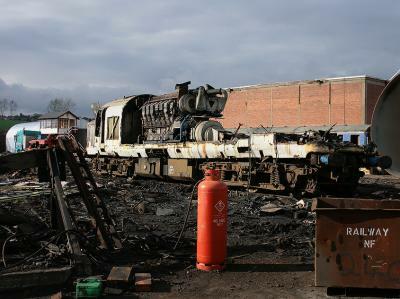 One of the class 312 units being demolished is seen to the left of 519. The class 312 units had been an unusual parts donor to Renown and Repulse, providing a source of multiple working sockets for the cab fronts, and some long terminal bars for the cubicle. 37519 and a Class 312 car 37519 in the cutting area on the 1st March 2008 with a Class 312 electrical multiple unit car. Notice that the cab side number had already been removed from 519. 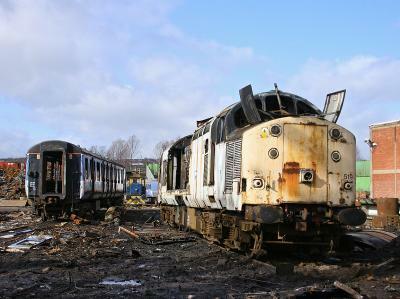 37519 in the cutting area on the 1st March 2008 with a Class 312 electrical multiple unit car. Notice that the cab side number had already been removed from 519. 37519 with power unit clearly visible The 12CSVT power unit can be seen to good effect in this shot of a sectioned 37519 on the 1st March 2008. Whilst being considerably smaller than the class 50's 16CSVT, the unit shares many common components, as such examples of the 12 CSVT have provided a number of spares for 29 and 30. The 12CSVT power unit can be seen to good effect in this shot of a sectioned 37519 on the 1st March 2008. Whilst being considerably smaller than the class 50's 16CSVT, the unit shares many common components, as such examples of the 12 CSVT have provided a number of spares for 29 and 30. 37887 arriving at Booths 37887 arriving at Booths on 5th March 2008. 37887 arriving at Booths on 5th March 2008. 37887 being unloaded 37887 being unloaded to the cutting area on 5th March 2008. 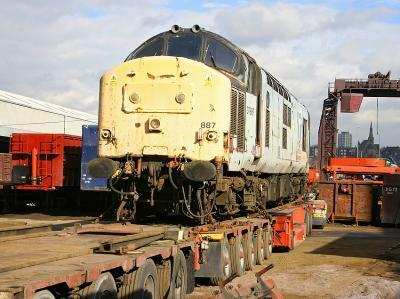 37887 being unloaded to the cutting area on 5th March 2008. 37519 nearly gone On 5th March 2008, only few days after the previous shots of 37519, demolition is considerably more advanced with all except one cab removed. 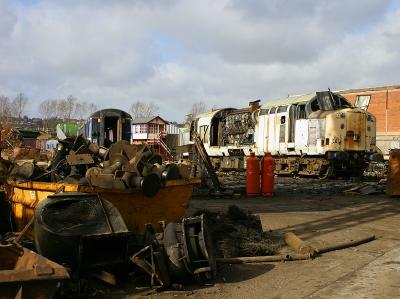 On 5th March 2008, only few days after the previous shots of 37519, demolition is considerably more advanced with all except one cab removed.